Some fabulous screenings and even a play! Apologies for the long newsletter, but so much to offer you this autumn! We still have tickets remaining for The Happy Prince (2018) Rupert Everett, who wrote and directed the film, also acts alongside a stellar, wish-list of a cast, including Colin Firth, Emily Watson, Tom Wilkinson and Anna Chancellor. Depicting the time after his release from Reading Gaol, it follows Oscar Wilde’s last days of exile to the continent where he is lost in bankruptcy, infamy and pain. A Matter of Life or Death (AKA Stairway to Heaven). The film starred David Niven and Kim Hunter along with Raymond Massey and Richard Attenborough. A British, all-time classic fantasy-romance film set in England during the Second World War. The film was chosen for the first ever Royal Film Performance on 1 November 1946. It is stimulating, thought provoking, a mirror to the post war world and relations between peoples. No matter how many times you see the film, it never fails to touch. It will make you smile, laugh, think, and cry and is as fresh today as it was in 1946. It has become a classic film and a must see and has been voted No 2 out of the 25 best British films ever made. Come and see this film – you will not be disappointed! Swimming with Men (2018). Did you enjoy The Full Monty? If you liked that, you are going to LOVE this! Based on a true story of a group of Swedish men who competed in the synchronised swimming world championship. This is a feel-good film from Director, Oliver Parker, with a terrific cast featuring the likes of Rob Brydon, Jim Carter, Nathaniel Parker, Rupert Graves, Daniel Mays and Jane Horrocks, among many other well-known actors. "The first rule of swim club, don't talk about swim club". A brand new, multi award winning play to commemorate the 100th anniversary of the end of the First World War. 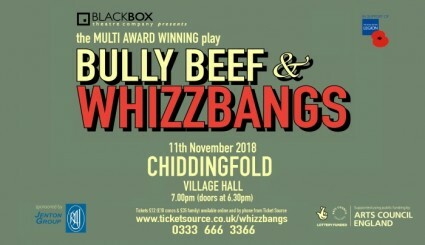 Set on the battlefields of France during 1916, BULLY BEEF & WHIZZBANGS takes a wry and often humorous look at life in the trenches through the eyes of its two reluctant heroes. Smudger, a new arrival at The Front, is keen to shoot his first 'Jerry.' Harry, a war weary veteran, is more interested in keeping his head down, thinking of home and having a nice mug of tea. Stuck in a hole, surrounded by mud and death, how will our boys cope with the ever-present danger of being shot or blown to smithereens? The play runs 1 hour 15 mins and there will be a 20 minute Q&A afterwards. The bar will be open (before and after) and tea/coffee and cakes will be available. The play is now at 5pm and not 7pm as originally advertised, so that attendees have the opportunity to get to the Village Green at 6.55pm for the lighting of a beacon, a reading and the playing of the last post. We are pleased to announce that BlackBox Theatre Company are allowing us to offer discounted tickets to our cinema patrons who book via the website.